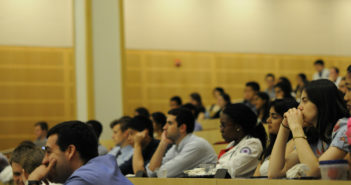 First-year graduate students arrive on campus to pursue degrees from the Driskill Graduate Program in the Life Sciences, Northwestern University Interdepartmental Neuroscience Program, Medical Scientist Training Program, and more. The 163 newly-matriculated students who represent the incoming class hail from 35 states and 9 foreign countries, speak 20 different languages and have a collective total of 79 undergraduate majors ranging from anthropology and biomedical engineering to economics and public health. Four medical school alumni shared their secrets for success and bestowed career advice on medical students at a career advising event on Monday. The 156th Founders’ Day welcomed the incoming Class of 2018 to medical school bestowing first-year students with their white coats. First-year medical students start the year with interactive lectures, team-based learning and clinical experiences during the Introduction to the Profession Module. Two medical school graduate students received Innovation to Commercialization Fellowships to develop skills to be successful innovators and entrepreneurs. Third-year medical student Adina Goldberger will use her Schweitzer Fellowship to develop and implement a discussion-based preventative health program for women currently incarcerated in the Cook County Jail. MSTP celebrated its 50th anniversary with a poster session and reception attended by students, alumni and faculty.